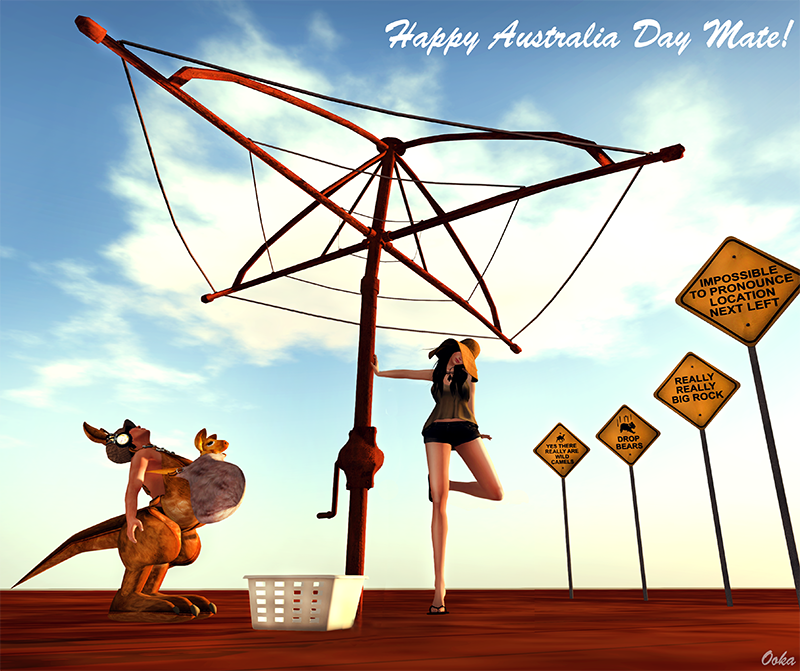 Fluffy Tails & Sharp Teeth: Happy Australia Day! We have wild camels! 750,000 they reckon, lol. We have 9 out of 10 of the world's deadliest snakes. We have 3 times more sheep than people. There are 1,500 species of spiders in Australia! Only in Australia can you say you've been to Woop Woop or Wagga Wagga and not be joking. Koalas are stoned pretty much all of the time because of the eucalyptus oils, that's why they seem so relaxed! We don't ride to school on kangaroos! In fact, if you're in the city you are unlikely to see any. In the outer suburbs and the outback you're more likely to see them. The outback is said to be one of the best places in the world to view the stars at night. Australian beaches are said to be some of the best in the world. Labels: .Birdy., Clef De Peau, Cynful, DelMay, Inertia, Ink, Katakuri Zenovka, League, Maitreya, NeoX, Slink, Weather or not?